Finally! 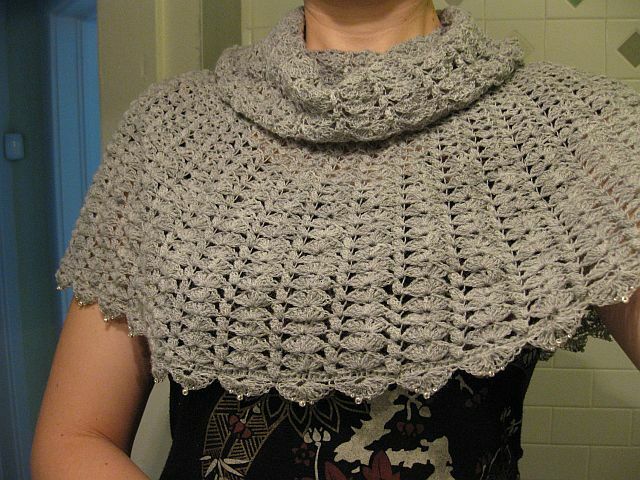 I finished the ponchette I’ve been working on for ages. I don’t think I could have done any better, given how unreliable the pattern was, but it still doesn’t look much like it was supposed to. To add the beads to the trim on the very bottom row, I pre-strung them on the yarn. Then I pulled the yarn through all the beads until I needed one. 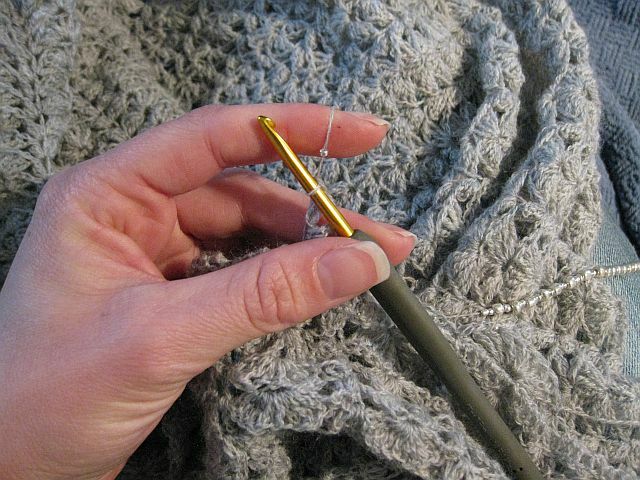 I brought it close to the hook, then did one chain before continuing with the shell. I tried more beads and less beads, but two small ones around a larger central bead felt the most natural. Despite being a match to the pattern for measurements, it just came out too small. I’m sure there’s a life lesson in here somewhere about patience and learning, maybe even expectations, but I’m tired of thinking about this project. Let’s just say every hit can’t be a home run, and never speak of this person sized tea cozy again. This entry was posted in fiber art and tagged bad patterns, beads, crochet, crochet ponchette, disaster projects, patience, ponchette, yarn. Bookmark the permalink. Thanks, I think you’re right. It needed to be looser all around, to match the pattern. If I ever have the patience to try again, I’ll know what to do. Well it does look very pretty indeed now you’ve finished it. 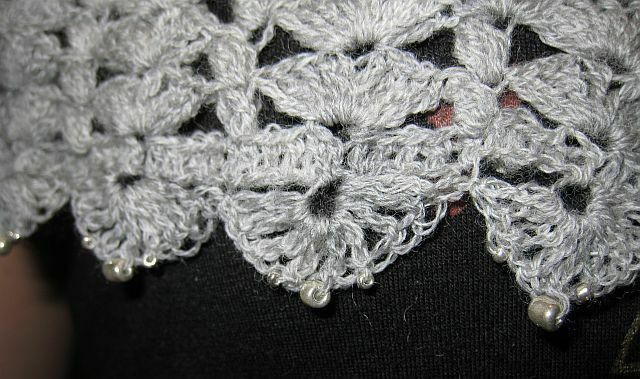 The only difference I can see is the yarn, which on the pattern looks more lacy-like. It’s more floppy. Yours looks stronger (and warmer) so be happy with that. I would be! Thanks! Maybe I’ll adjust…sometimes it just takes me a bit. I do like the yarn, one of my favorites I’ve ever worked with! I think it is beautiful – it really doesnt need to look identical to the pattern. 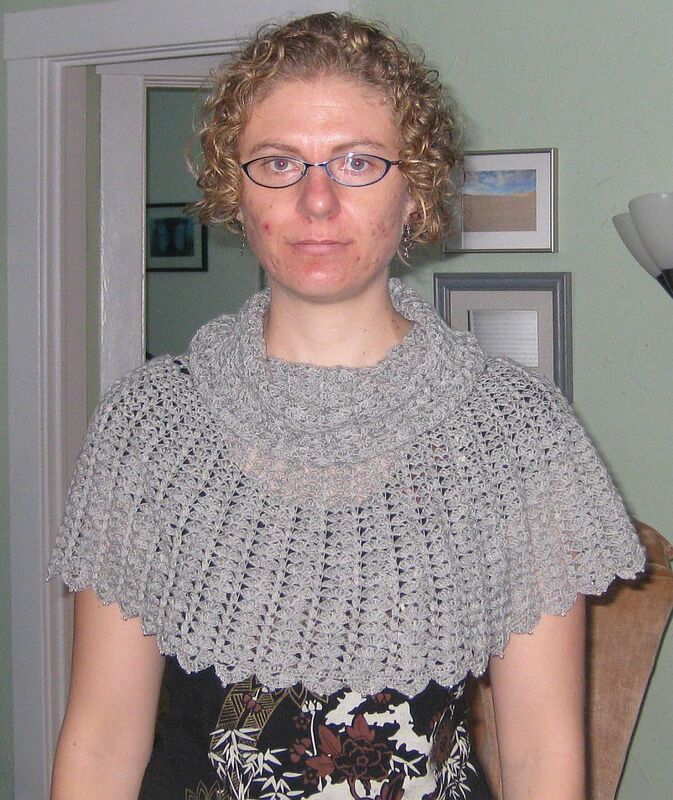 You do spendid crochet and should just love this piece on its own terms! Good points, all! Yes, I should just appreciate it for what it is. It might just take me a bit of time to adjust to it. Well, I don’t think it looks like a tea cozy, exactly. This is your momma talking here, let’s face it-it just isn’t what we had in mind, that said,it is still a lovely piece. Daddy and I got a charge out of your face in the photo. Remember, there’s no harm in trying. Yeah. That was the best I could do for a smile. I’m sure you’re seeing what I’m actually thinking though! Ah well, better luck next time.